Ralph Kennedy Johnston (now using the forename Ken) is a retired aerospace worker, ex-US Marine cadet and so-called "NASA Whistleblower." His principal claim to fame within the NASA-hating community is that he refused to follow orders and destroy an extensive collection of 8×10" glossy photoprints from the Apollo program. Johnston was born in Corpus Christi, Texas on 2 October 1942, and studied at Oklahoma City University. He enlisted in the US Marines in August 1962 and reported to Pensacola, Florida as a Marine cadet for flight training in September 1964. He left the Marines in August 1966. As a qualified avionics technician, Johnston was hired by Grumman Aircraft, principal contractor for the Apollo Lunar Module, to assist with cockpit and instrument development and training, in Houston. He has described his status at that time as a "civilian astronaut consultant pilot." From 1969 to 1972, during the Apollo Program, he was employed by Brown & Root, principal contractors to NASA for management of the Lunar Receiving Laboratory, where all the moon rocks were stored, curated, catalogued and in some cases distributed to scientists who had successfully applied to carry out analysis in their own labs. An important part of Johnston's duty was to package and ship lunar samples to science labs, together with photographs documenting their exact location and orientation in situ. As such, he had in his office several sets of photographs taken by Apollo astronauts with their chest-mounted Hasselblad cameras. When the moonrock distribution wound down, he was instructed by Bud Laskawa, his boss, to destroy what remained of the photo archive, but he kept one set as a personal collection. Johnston applied to NASA for the 1977 astronaut selection for duty as a Space Shuttle astronaut, but was turned down on the basis of inadequate academic qualifications. The ideal astronaut was no longer a jet-jock, but a highly educated person with useful skills. Accordingly, Johnston obtained a Ph.D. in metaphysics from the Reform Baptist Theological Seminary in Denver, Colorado, and began using the title "Dr. Johnston". However, by the time NASA was recruiting again, Johnston says he was considered too old. He did, however, join NASA's educational outreach program as a "Solar System Ambassador" — a purely voluntary appointment. In 1980 Johnston was hired by Martin Marietta and sent to Vandenburg AFB in California to be part of a team adapting that launch site for launching the Space Shuttle. As a result of the Challenger disaster in January 1986, the Vandenburg plan was scrapped and Johnston laid off with the rest of that team. His last job in aerospace was with Boeing in Seattle, where he was designated as a human factors engineer. Johnston styles himself "Lieutenant Colonel USAF/CAP" for certain public occasions. The rank is an honorary title within the Civil Air Patrol —Johnston has never been an officer of the US Air Force. That the extremely limited number of high-quality, first or second generation copies of the unique photographic record of Man's first voyages to the Moon could be so blithely … destroyed … infuriated him almost beyond words … Hoagland finally had his "smoking gun." 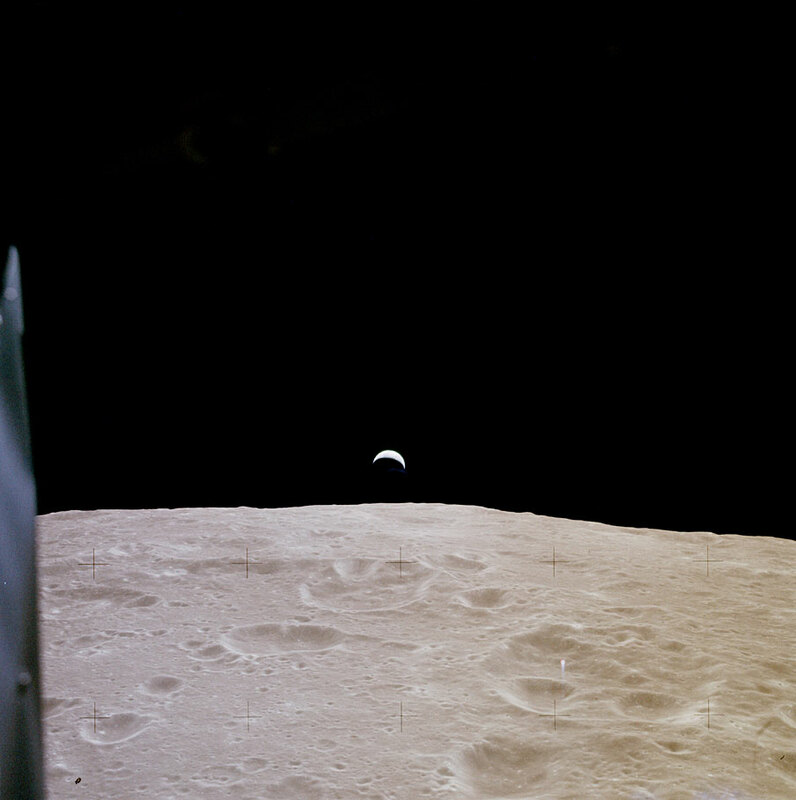 In scanning Ken's priceless Apollo 14 C-prints, [I'd] discovered that the computer could "see" what the human eye could not—incredible geometric detail in the pitch black areas, like the lunar sky. 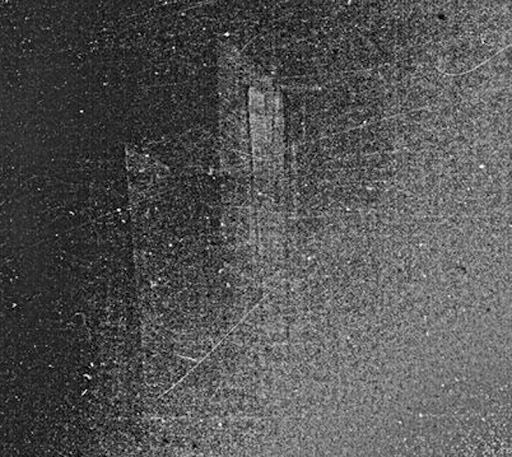 The sensitivity of modern CCD imaging technology, in even commercially-available image scanners, coupled with the amazing enhancement capabilities of state-of-the-art commercial software — like Adobe's Photoshop—allowed the invisible detail buried in these supposedly black layers, of these thirty-year-old emulsions, to ultimately be revealed—a "democratization" of technology that no censor at NASA could have possibly foreseen over more than thirty years. That statement is absolute poppycock a misunderstanding. Of course scanning can not reveal "invisible detail" if it truly is invisible. Hoagland has made a career out of trumpeting the fact that his scans of Ken Johnston's collection show things that the "official" scans do not. But of course, he's comparing, on the one hand, a professionally scanned image from an original negative or internegative done in a clean room — and on the other hand, a photoprint stored in a ring binder for 23 years, then pulled out and scanned on Hoagland's office scanner, the glass of which is quite clearly contaminated. [note 2] For use as Powerpoint™ slides, Hoagland typically slams up the brightness — a procedure guaranteed to reveal any scanner contamination wherever the image is black. In June 2016, Johnston issued a press release noting donations he had made to the Roswell UFO Research Center. Appended was a series of examples of what are claimed to be things such as lunar bases, satellite dishes, etc. that are not seen on the "official" NASA photo archives. This collection was curated by Bret Colin Sheppard, who calls himself an anomalist. Once again, scanner contamination is the most obvious explanation for many of the artifacts Sheppard has collected. He does not tell us who carried out these scans or under what conditions. The scan of AS12-49-7224, for example, includes dirt and a fiber. Here's the NASA scan for comparison. Features claimed as "a statue" and "ruins" are just large rock formations. In other images Sheppard draws attention to features that are not substantively different from the NASA official versions. "In early 1995, Hoagland was on a lecture tour in Seattle. It was then that he met Ken Johnston — a Boeing engineer at the time, and a former fighter-jock and test pilot for Grumman Aerospace. After his tour of duty in the Marines as an F-4 pilot, Johnston had gone to work at NASA in the mid-1960s as the chief Lunar Module test pilot at the Manned Spacecraft Center in Houston. "In early 1995, Hoagland was on a lecture tour in Seattle. It was then that he met Ken Johnston — a Boeing engineer at the time, and a licensed pilot. After his tour of duty in the Marines where he trained in planes like the F-4 Phantom, Johnston had gone to work at NASA in the mid-1960s under a contract to Grumman Aerospace at the Manned Spacecraft Center in Houston. It's not clear whose face the egg was on — Johnston's or Hoagland's. Maybe both. At any rate, this controversy ended up getting Johnston dropped from the "Solar System Ambassador" program, and thus was born the myth that he was "fired from NASA" for revealing things NASA would prefer to keep hidden. Hence his entirely unjustified reputation in pseudoscience circles as a hero and a whistleblower. Note that he was never at any time an employee of the Agency. In early 2017 Ken was invited by the Chennai chapter of the Aeronautical Society of India to participate in an international space seminar, inaugurate a Link flight simulator, and give several talks to young students encouraging them to pursue careers in the Indian space program. Several local news reports described him as "a NASA astronaut" and even "chief trainer at NASA". A permanent plaque beside the flight simulator uses the descriptor "NASA astronaut USA". NASA itself heard of this imposture and informed the State Department of the apparent fraud. As a result, Ken was declared persona non grata and required to leave India. The shocking turn of events was reported at length on Assam TV. Note: James Oberg did write to ASTEC requesting information but not until five days after Johnston went home. Johnston is a popular interviewee on television shows that denigrate NASA. [note 4] During these appearances, and in radio interviews, he has made several allegations about deceptive practices within the NASA photographic division. He has maintained that he personally witnessed technicians painting out stars on the camera negatives of Apollo images. 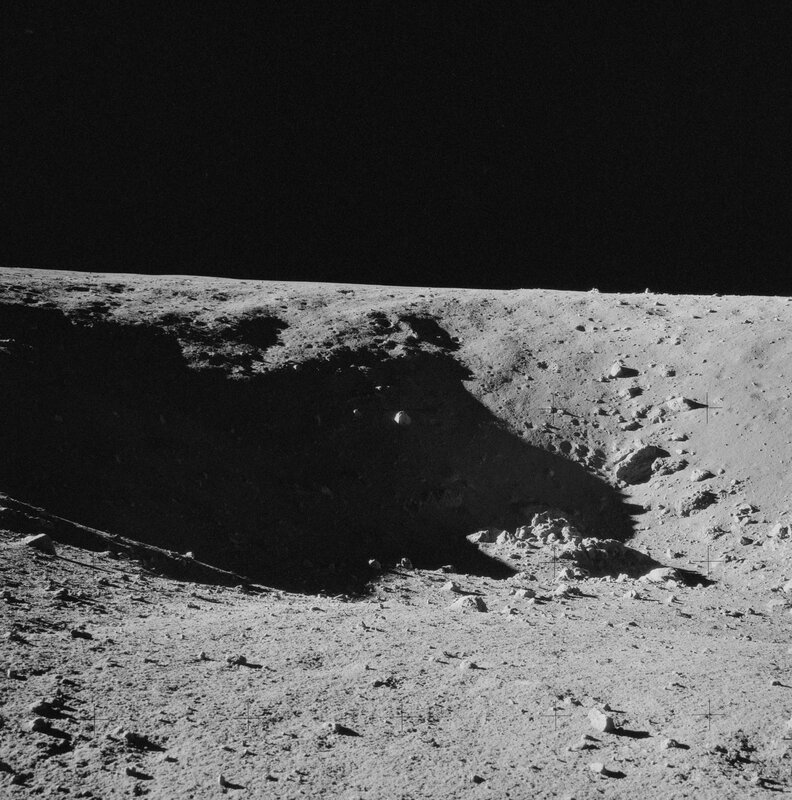 [note 5] He likes to tell the story of how, at the request of Dr Thornton Page, he showed 16mm film shot by the crew of Apollo 14 as they overflew Tsiolkovsky, a very large and intriguing crater on the back side of the Moon. He says flashing lights were clearly visible in the crater, but the following day when he ran the film again the lights were gone. Johnston, Dr. Ralph Kennedy Sr (2016). Ken's Moon: The Smoking Gun that Reveals the Dark Secret of NASA. CreateSpace Amazon self-publishing. ISBN 978-1535205962. Hoagland, Richard C.; Bara, Mike (2007,9). Dark Mission: The Secret History of NASA. Port Townsend: Feral House. ISBN 978-1-932-59526-0. Sheppard, Bret C. (2016). Flyover Tsiolkovsky Crater: A Secret Base on the Moon. CreateSpace self-publishing. pp. 104. ISBN 978-1541162624. Johnston Sr., Ken (2018). Regression of a NASA Whistleblower: Selections from a Regression Session with Commentary. CreateSpace self-publishing. pp. 150. ISBN 978-1718866003. ↑ Even if he'd been selected for the very first expedition, he would have been 81 years old. ↑ There cannot have been stars in these images. It would be impossible to set a camera to expose correctly for the bright lunar terrain and also the much fainter stars. On a negative, the sky would be transparent and any stars would be black dots. "Painting out" would be a very tricky process. It is far more likely that what Johnston saw was painting out sparkle on reversal or interpositive film, that might have been misinterpreted as stars. ↑ For example, Sheppard writes that when LMP Ed Mitchell says "I'm all set up for this acquisition. OK, HIGH GAIN, MANUAL, and WIDE" he's referring to camera settings on the Data Acquisition Camera (the 16mm film camera.) In fact, "acquisition" means acquisition of a radio signal from Houston, and the settings are for the high gain antenna to ensure best possible reception. ↑ Boyle, Alan (9 September 2013). "More than 2,700 pay up for a chance to take a one-way trip to Mars". http://www.nbcnews.com/science/more-2-700-pay-chance-take-one-way-trip-mars-8C11115364. Retrieved 4 December 2013. ↑ "Mars One Announces Round Three Astronaut Candidates"
↑ Coast to Coast AM 25 December 2011. 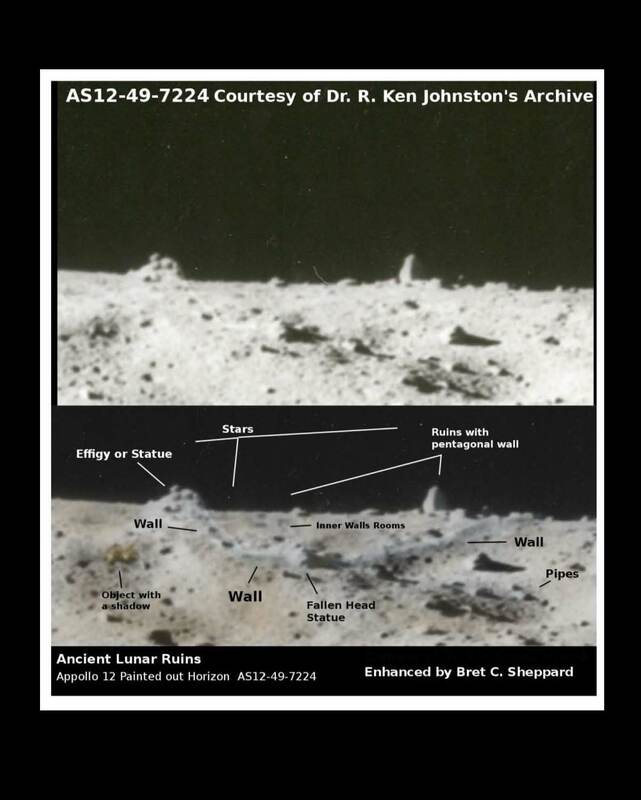 "Ken shares his contention that NASA knows there is evidence for both modern and ancient artifacts on the moon, as well as an active base there. He explained that in his position as Photo Control Dept. manager, he had access to highly detailed film and negatives taken during the Apollo missions." This page was last modified on 4 March 2019, at 17:35.